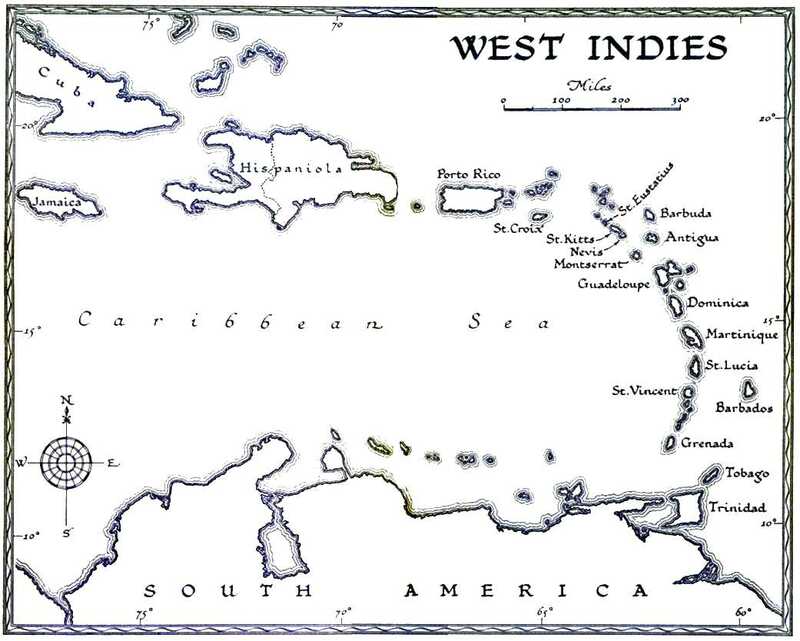 Alone in the Caribbean went through at least 3 printings. I've seen copies dated 1917, 1940, and 1958. The 1917 edition has more photos than the later editions. All the photos are included here. [Pages 128-129 ] in Sailing Craft, by Schoettle, ed. Another very successful builder of splendid canoes was W. F. Stevens. Mr. Stevens was a waterman from his early youth. He built for himself a small sailboat when he was sixteen years old. Later he built racing shells, and rowed them too. While engaged in this business at Lowell, Mass., about 1890 he came under the notice of Paul Butler. From then on the names of Butler and Stevens became coupled among canoeists. Stevens built all the Butler designed and owned canoes, Wasp, Fly, Bee, Bug, etc., all wonders of design and workmanship and all successful racers. In 1898 he located in Bath, Maine, where he built several of his most successful canoes. In 1906 he went to Marblehead, Mass., and became associated with W. Starling Burgess, well-known naval architect and sportsman. In 1910 he retired from business and went to live at Boothbay Harbor, Maine. In 1913, however, he consented to build, from his own design, what was probably his most famous canoe, Mermaid, owned by Leo Friede and sailed by the latter in all his races. Damosel, another Stevens canoe, built about 1896, owned and sailed by James Newman, twice defeated Friede in important races on Charles River Basin, Boston, once in 1913 and again in 1919. 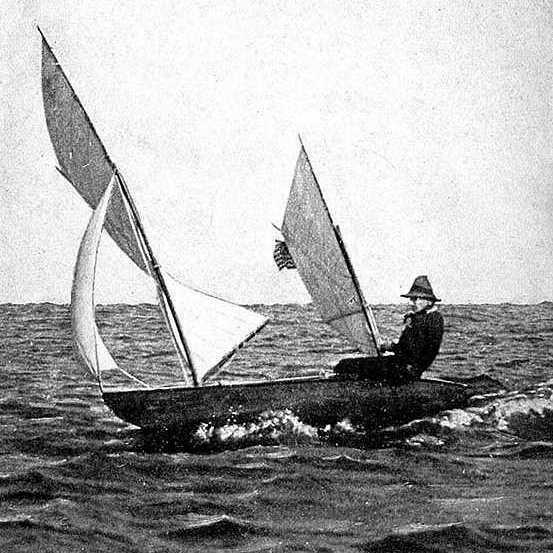 Stevens also built Uncle Sam, in which H. Dudley Murphy unsuccessfully competed in England for the British Royal Canoe Club Challenge Cup in 1901, and he designed and built Yakaboo, a cruising canoe, in which Frederick A. Fenger cruised 800 miles in the Caribbean Sea from Grenada to the Virgin Islands, in 1907. Yakaboo was 17 feet long, 39 inches beam, and weighed 147 pounds. She had no rudder, being steered entirely by trimming the sheets, and by shifting the centreboard forward or aft as necessary. Her rig was a small jib and two hoisting batswing sails, that could also be reefed. The last canoe built by Stevens was Doris III, built in 1918 for Mr. Yngve Froling of Gothenburg, Sweden. Doris III is 17 feet long and 40 inches beam, an able cruising canoe. Stevens died at his farm at Boothbay Harbor in 1922 or 1923. A splendid type of down east Yankee waterman. Approximate dimensions. You have to love these batwing sails. Sail plan, after Yachting Monthly. Open seasonally: the original Yakaboo is there. They still haven't gotten the word about Yakaboo's actual builder. In the manuscript collections at the Blunt Library you can see assorted documents from Fenger's trip, the manuscript version of Yakaboo's log, and a typescript of the logbook. There is much other Fenger material but it seems to be all related to his later experiments in hull shape and sail rig. Nevertheless it's interesting to read over the logbook. From WoodenBoat #119, starting on page 80. Joe is associated with the Alexandria Seaport Foundation. A Bequia whaleboat is under restoration at ASF, too. WoodenBoat #82, page 5: (letter about Yakaboo by John Martsolf). 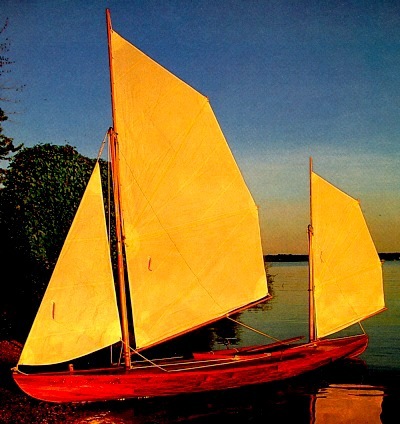 Sail and Oar by John Leather: one chapter discusses rudderless boats including Yakaboo. Yachting (USA) - July 1914 and July 1919. Nor the original Outing series, which I'll have to see on microfilm, I guess. A Canoe in the Caribbean. Vol. 31 -- July 1921. The editorial comments are, I assume, from Maurice Griffiths. Some time ago I promised to obtain information regarding the canoe in which Mr. Fenger made his remarkable voyage among the Caribbean Islands. Here are the plans which he has very kindly sent to me from Massachusetts, and as they were not published in his book they should be of world-wide interest. 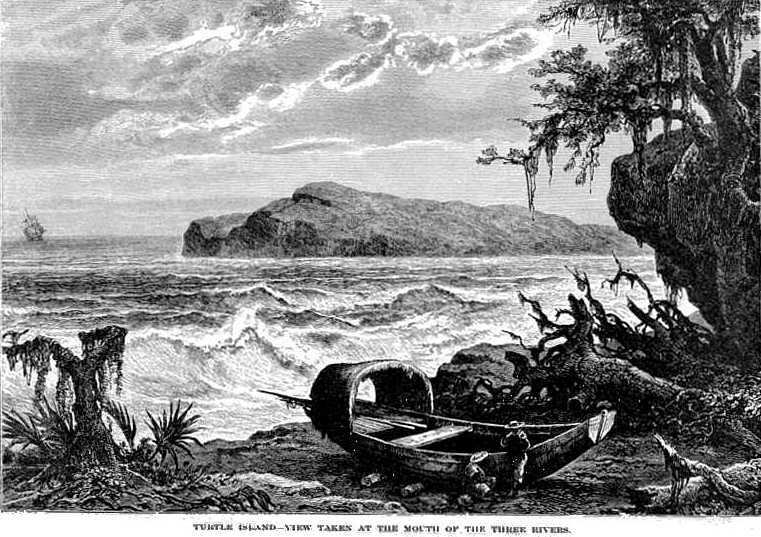 While the many voyages in large boats are wonderful in their way, Mr. Fenger's exploit was almost unique. I use the word "almost," for one must not forget Tilicum, the incredible canoe in which Captain Voss went round the world. She, of course, was large enough, but she was a canoe, a dug-out, and an ungainly brute. How he ever navigated her puzzles me to this day. Mr. Fenger, however, is an expert canoeist, but anyone who wishes to read of his voyage must do so for themselves in "Alone in the Caribbean," published in America by George Doran in 1917, when its author was serving with the U.S. Navy in European waters. "She did not look her length of 17 feet and with her overhangs would scarcely be taken for a boat meant for serious cruising. Upon close examination, however, she showed a powerful midship section that was deceiving, and when the natives lifted her off the horses -- "O Lard she light !" -- herein lay the secret of her ability. Her heaviest construction was in the middle third, which embodied fully half her total weight. With her crew and the heavier part of the outfit stowed in this middle third she was surprisingly quick in a seaway. With a breaking sea coming head on, her bow would ride the foamy crest, while her stern would drop into the hollow behind, offering little resistance to the rising bow. She had no rudder, the steering being done entirely by the handling of the main sheet. By a novel construction of the centerboard and the well in which the board rolled forward and aft on sets of sheaves, I could place the center of lateral resistance of the canoe's underbody exactly below the center of effort of the sails, with the result that on a given course she would sail herself. Small deviations such as those caused by waves throwing her bow to leeward, or sudden puffs that tended to make her luff, were compensated for by easing off or trimming in the mainsheet. In the absence of the rudder-plane aft, which at times is a considerable drag to a swinging stem, this type of canoe eats her way to windward in every squall, executing a "pilot's luff" without loss of headway, and in puffy weather will actually fetch slightly to windward of her course, having more than overcome her drift. She was no new or untried freak, for I had already cruised more than a thousand miles in her predecessor, the only difference being that the newer boat was nine inches greater in the beam. On account of the increased beam it was necessary to use oars instead of the customary double paddle. I made her wider in order to have a stiffer boat, and thus lessen the bodily fatigue in sailing the long Channel runs. She was divided into three compartments of nearly equal length -- the forward hold, the cockpit, and the afterhold. The two end compartments were accessible through watertight hatches within easy reach of the cockpit. The volume of the cockpit was diminished by one half by means of a watertight floor raised above the waterline -- like the main deck of a ship. This floor was fitted with circular metal hatches through which I could stow the heavier parts of my outfit in the hold underneath. The cockpit proper extended for a length of a little over six feet between bulkheads so that when occasion demanded I could sleep in the canoe." The dimensions I have put on the plans. While not being most efficient, the rig was chosen because of the short spars and ease in reefing and handling. How even an experienced canoeist could travel so far and so fast in such a boat, and without a rudder, will puzzle many. It was a wonderful undertaking, and Mr. Fenger deserves credit for his navigation and his clever little craft. Click the pic for a much larger image. unloaded, but with the crew on board, 4-1/4"
Spars and Sails 25 lbs. From Élisée Reclus, The Earth and its Inhabitants, North America / edited by A.H. Keane. New York : D. Appleton, 1890-1893. 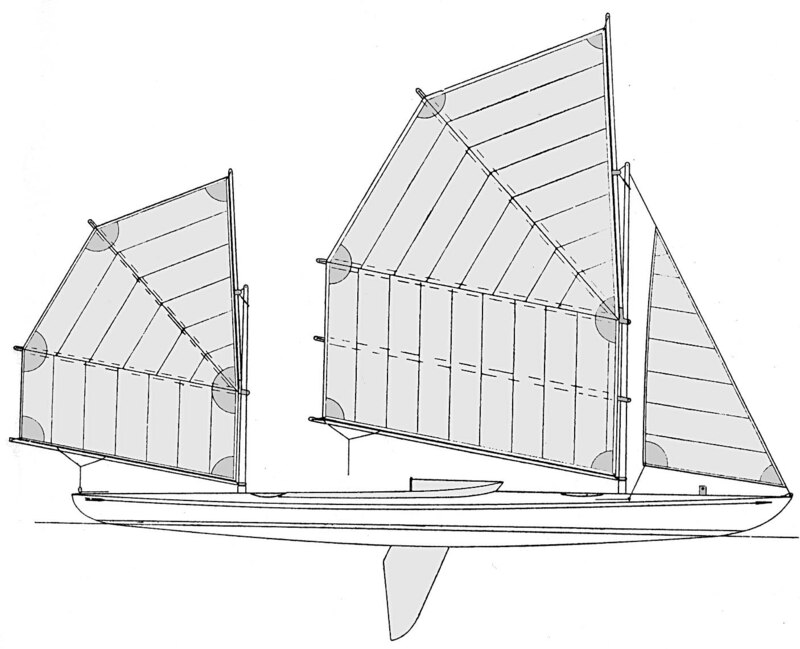 A drawing of the same type punt appears in American Small Sailing Craft by Chapelle. Fenger does not mention this type of boat, but it's unusual and apparently not well documented. The original volumes in French date from 1880-85 or so. From Down the Islands by Wm. A. Paton, an account of a trip through the Caribbean in a steamer in the 1880s. Not very interesting once you've read Fenger but a few nice illustrations. Princeton University holds a collection of Paton's artwork and photos. From Reclus, above. 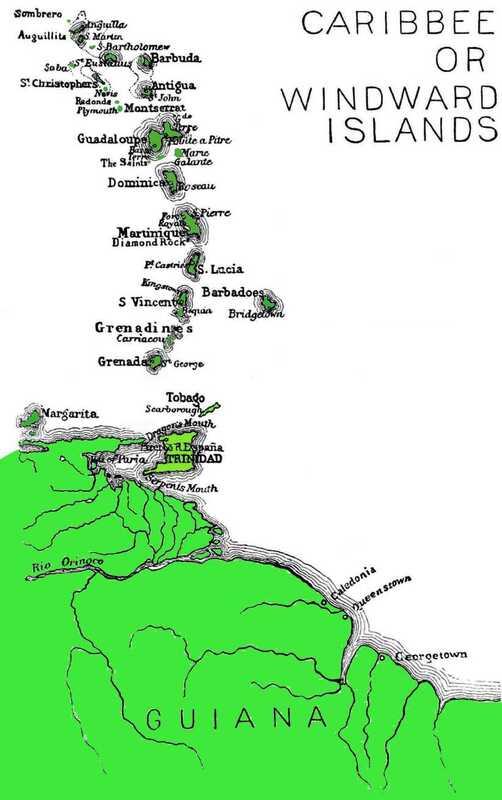 See also Fragment of a Voyage to Louisiana, where Reclus writes of sailing through the Caribbean in about 1852.